In the Fear Ship’s control room, Marlow boredly watched the power gauge slowly rise. In another couple of hours it would be fully charged and the Fear Ship would be ready to lead Dark Kat’s conquest of Megakat City. Until then, though, Marlow was bored silly watching a control panel. He shooed away some of the Creeplings that were crawling all over everything. Hearing footsteps, he turned as Zeckis ran up looking excited. “Just do it!” said Zeckis. “Don’t order me around!” snarled Marlow, but turned on the main viewscreen. That reporter she-kat with the weirdo hairdo appeared, standing outside of Enforcer Headquarters. Whatever was happening it was big. A parade of some sort? There were Enforcer officers keeping back crowds of cats in various states of emotion. Some excited, some angry. Some were crying. Mostly she-kats but a few men as well. “As you command!” Zeckis scampered away. On the screen, a helmetless T-Bone and Razor were being led up the front steps of Enforcer Headquarters. Dark Kat walked in followed by his entourage of chittering Creeplings, looking annoyed. Zeckis trailed behind. Ann Gora’s cameraman attempted to get in close but was shooed away by a glowering Commander Feral. “Commander Feral, please, the press has a right to–” Ann’s voice cried out in protest. Feral motioned for his men to halt and approached the cuffed vigilantes, Ann’s camerman following closely, getting a good shot over the Commander’s left bicep. One of Feral’s large hands reached for T-Bone’s head. The yellow furred cat flinched away and was held in place by the escorting commandos as Feral seized the top of the black mask. The crowd – and, in the Fear Ship, Dark Kat and his technicians – waited with bated breath. Then with a tug Feral tore the mask off, revealing a handsome but unremarkable yellow-furred male feline. Interesting, thought Dark Kat, how much of the mystique vanishes without the mask. Feral threw the mask aside and repeated the motion with Razor, who struggled fiercely. Rage boiled in Dark Kat. How dare that nobody Enforcer commander be the one to unmask his lifelong enemies? That right was Dark Kat’s and Dark Kat’s alone. Well, there would be time to punish Feral for his impudence later, Dark Kat decided. No sense getting worked up over it now. T-Bone and Razor, or rather, Chance and Jake now that they’d been officially unmasked, growled at Feral as the crowd again reacted with a mixture of emotions. Shock, anger, delight and in some cases, awe. There were even a few kittens waving autograph books and pens. It was all the Enforcers could do to keep them back. He moved away and headed up the steps of the building. Dark Kat pressed a button, and the viewscreen went blank. “Yes, Lord Dark Kat,” Marlow responded. Marlow and Zeckis stood at attention as Dark Kat stalked from the control room. While his subordinates plotted the deserving deaths of the SWAT Kats, he had much more important things to attend to in his onboard laboratory. Lieutenant Felina Feral stood at the top of the steps of Enforcer Headquarters, watching with disgust at the display her usually sensible uncle was putting on. This wasn’t right. If he had to arrest the SWAT Kats, he could’ve at least let them keep their dignity! She gave the SWAT Kats a sympathetic look as the commandos led them up the steps, past her and into the building. In the instant that their faces met, T-Bone scowled, but Felina could tell by his eyes that he appreciated her sympathy, and Razor managed a weak smile. Felina was struck by how much different they were unmasked. It was clear they were the same two cats she’d fought alongside dozens of times, but now that she could see their eyes, they were far more expressive. It moved her and made her annoyance, no, her anger at what her uncle had just done all the more intense. And then the moment was over, and the commandos had ushered the handcuffed SWAT Kats. Hearing her uncle’s bootsteps coming up, Felina whirled to him and glared with a ferocity that made Feral step back and almost fall down the steps. He looked startled, but not unsurprised by his niece’s anger. “Not here, Felina,” he grumbled, anticipating her words. “Why?” she demanded to know. He didn’t answer. He simply stormed past her and into the main lobby of the building. Felina followed, matching his pace. The doors swung shut, drowning the noise of the crowds outside to a dull muffle. As Feral headed for the elevator, Felina got in front of him, blocking his path. He stopped and stared down at her. Feral blinked and looked hurt, as if he had only just that moment realized the enormity of what he’d done. He recovered quickly, though, and straightened his shoulders, jutting his large chin forward, looking authoritative. “I won’t help you bring down the–” Felina began. Felina stepped back, surprised. She was still fiercely angry with her uncle, but grateful that he was thinking of her feelings on the matter and, in his own blustery way, trying to help her cope. She nodded and got out of his way. He continued and took the elevator to his office. Upstairs in his office, Feral stood at the window overlooking the runway. Sighing, he turned and walked over to his desk, checking the clock. He was expecting Mills in a few minutes. Suddenly, the elevator door out in the waiting room dinged open. Was that Mills already? He was early. Feral heard his secretary tell whoever-it-was they couldn’t go in and then the door swung open with a bang. Feral actually jumped back, wide-eyed, as Deputy Mayor Callie Briggs stood framed in the doorway, her eyes narrowed to slits and her mouth twisted into a hateful scowl. Oh, great, thought Feral. What was she going to do? Claw out his eyes? She sure looked ready to spring at him. Composing himself and adjusting his uniform, Feral cleared his throat, overcoming his shock. For once, Briggs was going to be the one on the defensive. Now that Feral finally had those two troublemakers down in lockup, with the law on his side, he had nothing to fear from Briggs. Or from Manx. 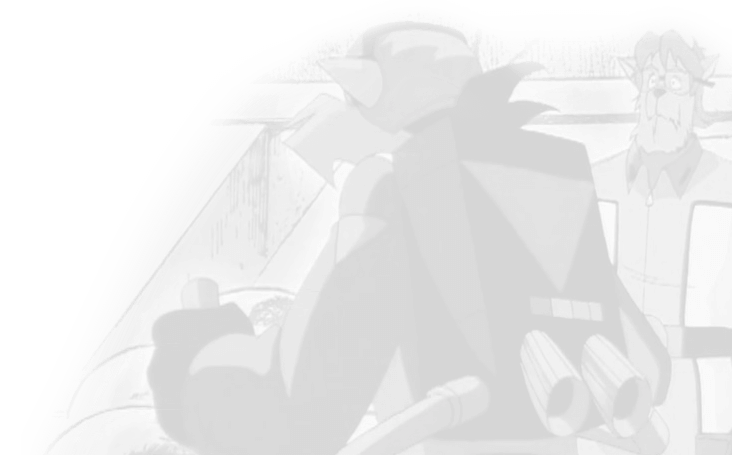 Feral knew Manx did not in any way endorse the SWAT Kats officially, no matter how many parades he offered to throw them, so he would in no way move to impede Mills’ efforts to bring the vigilantes to trial. Which left Briggs totally without any allies. All she could do was argue with her emotions and her idealistic worship of the SWAT Kats. Which she did. “But, how could you do this after everything they’ve done for Megakat City?” Callie said, storming up to the much taller male and glaring up at him. “Am I interrupting something…?” a voice said. Feral turned to see District Attorney Mills standing there. Feral groaned. It was like arguing with a brick wall. Briggs may have been an effective politician – although Feral dreaded the day when she became the new mayor – but whenever the SWAT Kats were involved, they could clearly do no wrong in her eyes, and the intelligent career she-kat was reduced to a starry-eyed fangirl as far as Feral was concerned. And, he didn’t have time to argue with her. Fortunately, she left then. She turned in a huff and shoved past the confused-looking Mills, leaving the office. Meanwhile, Chance and Jake were taken to the holding cells. Awaiting them were a grim-looking Jablonsky and a sneering Lyman. Crud, thought, Chance, these guys again. He’d forgotten all about them. They were like Burke and Murray but with badges. “Welcome to your new accommodations, Furlong, ” Lyman said. Chance remembered putting numerous perps in here himself, back when he and Jake were still just walking the beat. He never thought in this universe that they’d see the inside of one themselves. Jablonsky and Lyman took them from the escorting commandos and brought them to a cell with another occupant sitting on the bench with his head down, and Jablonsky opened the door. Chance briefly entertained the insane notion that he and Jake were back in the dark universe again as, with a shove, Lyman sent him stumbling forward so hard he ended up sprawling on his stomach. Jablonsky just pushed Jake in without any real malice, and then the door slid shut with a metallic clang that sound as loud as the trumpets of armageddon. Jake helped Chance up, but Chance shoved him away angrily. Jake stepped back, holding his hands up in an effort to placate his partner. “Enjoy your stay, fellas! And, feel free to socialize with yer cellmate!” Lyman cackled shrilly. “You might say he’s eager for some payback!” added Jablonsky. Laughing, the two turned and walked off with the commandos. Chance and Jake turned and looked at their cellmate, who very slowly lifted his moppy-haired head and blinked in surprise at them. Then a cruel, evil smirk spread across his lips. On the runway of Enforcer Headquarters, Felina Feral finished running the pre-flight check of her jet and slid her flight helmet on. She turned to the two Enforcer pilots who were to serve as her wingmen, Gavin and O’Herlihy. Both dependable fighter pilots who’d flown with her on missions before. “All right, everything check out?” she asked. As Felina climbed into her jet, and her men did the same, Commander Feral emerged from inside the building and walked over. 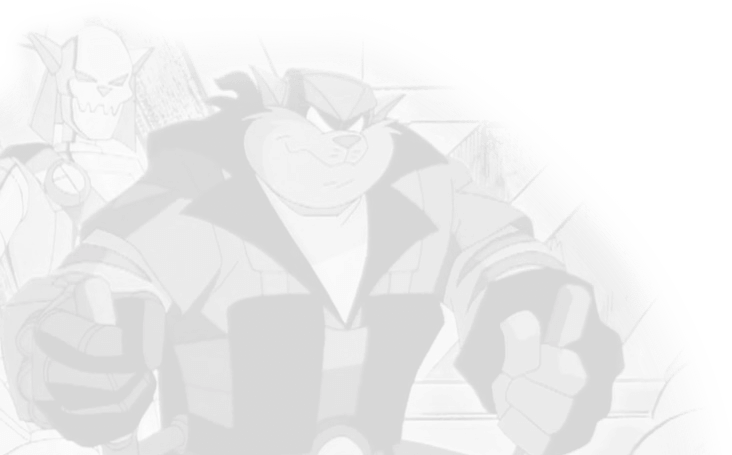 He’d finished his meeting with District Attorney Mills, giving him all the information he would need to make his case against the SWAT Kats, including access to the data on the Turbokat. Feral passed the vigilante’s jet while the technicians continued examining it and allowed his hand to slide along its smooth, black hull. If nothing else, it was a beautiful jet. Clawson was a genius if he was able to take a scrapyard model even more obsolete than the current Enforcer jets and turn it into the finest aircraft in Megakat City’s skies. Nevermind that this was the second or third one. Feral forgot how many times it’d been destroyed and rebuilt. He approached Felina’s jet and got her attention. “Felina,” he said. Felina blinked and looked down at her uncle. Some of her anger at him from before remained. “Yes, Commander?” she replied curtly. Whether Felina got the message or not, Feral didn’t know, but she smiled at him nonetheless. The cockpit canopy slid forwards, and Feral stepped out of harm’s way as the jet’s engines fired up. The jet shot off down the runway and took to the skies followed by the other two who were to serve as wingmen, headed off over the city skyline, toward the bay, and from there to Anakata Island. “Yes, sir,” Talon said. He saluted and walked off. Feral watched him go, then turned to look out over the city. The sun was starting to set, and Felina’s jets were already just specks disappearing on the horizon. In the holding cells, Chance angrily gripped the bars and scowled at his fate. Hard Drive still sat on the bench, not moving. Jake walked over and placed his hand on Chance’s shoulder, earning a glare over the shoulder from his partner. Chance didn’t answer. He merely continued standing there, still as a statue, gripping the bars. Jake took his hand off of his clearly troubled friend’s shoulder, but kept talking. “Oh, would you two cut it out with the touchy-feely nonsense!” Hard Drive piped up angrily. Chance whirled to him. Jake suddenly felt worried. Tensions had been mounting between these two ever since they were brought in earlier. Hard Drive was a petty two-bit thief, surge suit or no surge suit. He wanted to start a fight. Jake looked at Chance and sighed as he saw that look in his buddy’s eyes. He’d seen that look before, all those times Chance lost his temper and became unreasonably angry. Not that this look was any different than it had been two minutes ago, but Hard Drive was pushing Chance’s buttons, big time. “If you don’t like us talkin’, why don’t you come over and make us quit?” Chance challenged. Jake palmed his face in despair. This wouldn’t end well. He swung his fist, hitting Chance in the jaw. Chance staggered back, growled and jumped onto Hard Drive, knocking the villain flat on his back. Anger overcame him as he began pummeling Hard Drive’s face mercilessly. In his mind the powerless criminal beneath him was Commander Feral, and he was giving that big-chinned buffoon the beating of his life. He didn’t feel Jake trying to pull him off of his opponent, didn’t hear the sound of the cell door unlocking and the scuffling feet as Enforcers ran in to break up the fight. Jake was made to step aside by a commando as it took both Jablonsky and Lyman to pull Chance off of Hard Drive. The big cat wrestled with the pair, but Lyman managed to cuff his hands behind his back, and still he put up a fight so violent they had to hang on for dear life and struggle to make him sit down on the bench. The commando stooped down to examine Hard Drive, who was bloodied and bruised. “Keep that lunatic away from me!” Hard Drive yelped. “He’s okay, just some bumps and cuts is all, but, wow, did Furlong ever give him a pounding!” said the commando. The commando gingerly helped Hard Drive limp from the cell. Deputy Mayor Callie Briggs stood at the door, Sergeant Talon behind her. As she entered, Jablonsky and Lyman tried to stop her, but the Sergeant made them back off. Looking annoyed, Jablonsky and Lyman walked out. The Sergeant eyed Callie and said, “Five minutes,” then turned and followed the other two officers. “To say the least,” grumbled Chance. “Thanks, Miss Briggs,” said Jake, whose mind was, and had been since they were arrested, on the upcoming trial and the various legal issues. He knew that the case was mostly airtight. After all, he and Chance were guilty of exactly what Feral said they were. What they would need to do, he knew, was get a competent lawyer to argue that their breaking the law had been necessary for the greater good. That and get a really sympathetic judge. As Chance sat sullenly, not even cheered by Callie’s presence, one question was on Jake’s mind, and he voiced it. “Um, Miss Briggs, I was wondering… now that you know your beloved SWAT Kats are really your friendly neighborhood grease monkeys, I, uh…” He rubbed the back of his head. “I still think the world of you two, if that’s what you mean,” Callie replied, smiling gently. Jake mirrored the smile. “Thanks, Callie–I mean, Miss Briggs, that means a lot, but that isn’t what I meant. It’s just that it took so long for anyone to figure out who we really were that, well, I was curious if…” He trailed off. “What he’s trying to say,” Chance piped up, “is if you ever suspected the truth.” He smirked a bit at Jake. Chance and Jake reeled at this, blinking. She smirked and ruffled Chance’s hair as Jake laughed, with the thin brown cat amazed any of them could find humor in such a dire situation. That humor dissipated quickly as Jablonsky appeared and motioned with his hand for Callie to come with him. Time was up. Callie was in the middle of standing with a deep sigh when suddenly the lights dimmed a bit. Everyone started and looked surprised, and then the ground underneath Callie’s feet cracked and several pairs of pink hands shot up through the floor and grabbed her ankles. She screamed as she began to be pulled down into the gradually widening hole. Everyone acted all at once. Chance stood, then realized he hands were still cuffed behind his back, watching helplessly as Jake, assisted by Jablonsky, grabbed Callie and began a furious tug-of-war against the unseen menace. “Lyman’s got them!” Jablonsky grunted. Lyman came running up the hallway in response to the noise. The other prisoners were practically rioting at all this commotion. There was yelling, screaming, demands to be let free, total chaos. Finally, the combined might of Jake and Jablonsky pulled Callie free. Jablonsky let go and stumbled backward out into the hall where he crashed into Lyman, knocking both of them to the floor. Jake likewise flew backward onto the cell floor at Chance’s feet, and the unbalanced Callie landed on top of him. From the hole emerged three Creeplings, chittering angrily. But, these were unlike the usual Creeplings. Two of them carried small, Creepling-sized laser rifles, and all three wore little red-lensed tactical goggles. In response, one of the Creeplings armed with a laser gun pointed it at him and fired. It singed his cheekfur, and he dove aside, lost his balance, and fell to the floor a few feet away from Jake and Callie. His attacker leaped onto the bench, ignoring the other two, and fired at him a second time. Chance rolled to the side, and the laser blast struck the floor inches from a startled Jake’s head. One of the other two Creeplings, the unarmed one, lunged at Jake, but he kicked it, sending it flying out of the cell. It landed on Jablonsky and began frantically, ravenously attacking him, clawing and biting at his face as he screamed and thrashed. Lyman stood, looking shocked, and stared down at the third Creepling, who whirled and aimed its gun up at him. “A Creepling with a gun? !” he yelped. The Creepling fired, hitting Lyman in the shoulder. The Enforcer officer spun and hit the wall, then slid down with a groan. Jablonsky thrashed and pulled the Creepling off of himself and threw it away, and then reeled as as the other Creepling fired several laser blasts through his torso. He dropped. Both Creeplings then ran and resumed their attack against their original targets. The unarmed one leaped onto Jake’s chest, but he grabbed it and yanked it off, holding it at arm’s length as it squirmed and snarled. The other one fired, and Jake tossed his attacker aside and ducked. It smacked into the wall and fell down onto the bench. “Jake, the keys!” Chance yelled as he dodged another blast from his Creepling, who turned and began firing at Jake as well. While it was distracted, Chance managed to kick its laser gun away. Snarling, it began fighting him hand to hand. And, cuffed as he was, Chance for the first time found himself in a situation where a Creepling stood a chance of outmatching him physically. “Stay down, Callie!” Jake said, then leaped into the air, flipping over the Creepling at the door. It aimed up, fired and missed, putting a hole in the ceiling as Jake landed behind it and swung his leg, kicking it. He felt its spine snap, and it went flying forwards to land in a twitching heap beside Callie. Jake then ran to the unmoving form of Lyman, got the handcuff keys, and threw them to Chance… only for the Creepling he’d knocked to the bench to grab them. She took the keys from it and tossed them to Chance, then violently threw the little creature down and brought the stiletto heel of her shoe down upon it. It screamed shrilly as she ground it underfoot. The keys hit the floor, and Chance rolled over on them and grabbed them with his hands, struggling to unlock them even as the last remaining Creepling leaped onto his chest. He glared at it. Seconds before it would’ve attacked, he’d uncuffed himself and seized the little monster and lifted it until he was staring into the red lenses of its goggles. “You ugly little creep,” he snarled and grabbed the head and twisted. He winced at the sharp crack, then threw the lifeless little body aside in disgust and went to check on Jake and Callie to see if they were okay. He indicated the prone forms of the Enforcer officers. Lyman was only winged, and although badly hurt, Jablonsky still lived, but he’d need medical attention. The door to the cell block opened suddenly and a small army of Enforcers charged in and surrounded them, laser rifles aimed at them. Commander Feral himself strode in and pushed his way past his men to stand there glowering down at Chance and Jake as they kneeled over the body of Lyman. “What in the world–” he began. “Yeah,” said Jake as he stood. Two Enforcers tended to Jablonsky and Lyman. Suddenly, Feral whipped his blaster out and aimed it at Chance. He leaped back. “Move!” Feral yelled. Chance jumped aside, revealing the Creepling whose spine Jake’s kick had broken, crawling for the dropped miniature laser rifle. Feral fired, disintegrating the creature’s body into ash. Then he aimed down and repeated this gesture for the twitching Creepling at his feet.